Up for breakfast at Blu Marlin in Vernazza, and had a little walk around the town. 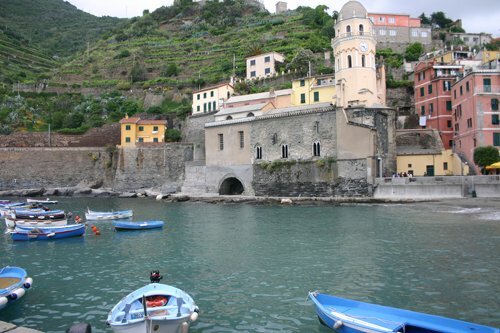 Of the 5 towns, Vernazza is supposed to be the prettiest but also the most touristy. 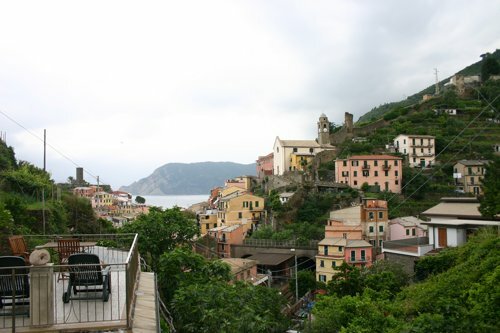 Corniglia is for wine enthusiasts and walkers, Manarola for sophisticated French and Italians, and Riomaggiore for .. I don't know. The furthest turret is a bar and the closest is someone's home! 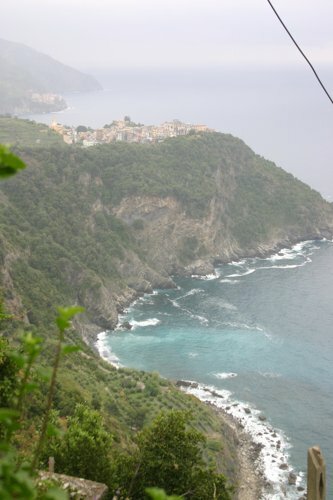 We walked along the steep track, which is made of slate and slippery granite, mud and clay, with no guardrails and a sheer drop into the ocean below, until we finally (after a brief rainstorm) came in sight of Corniglia. And we eventually came into the town, wet and in need of a coffee!! After that we went to the station to catch the train to Riomaggiore. You have to buy a ticket to walk the trails, and for a small amount extra this ticket entitles you to bus and train travel as well. 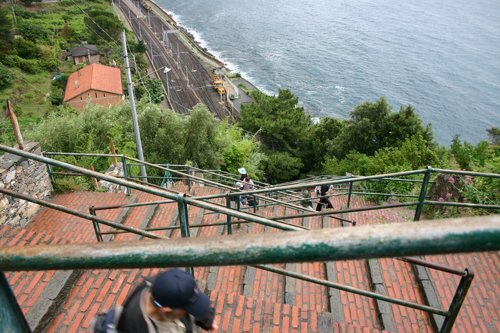 There are 365 steps down/up to the station at Corniglia from the town, as it's perched on a hill and the station is almost at sea level. We were walking down, and about 100 people were walking up, with surprised looks on their faces!!! 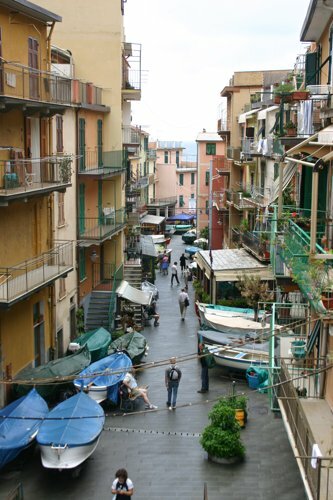 Riomaggiore has a covered walkway from the station to the town (as does Manarola) so we walked through and came into the town. It's quite pretty too. We had an Ok lunch at a restaurant recommended by the guidebook (it was the Lantern - food good but service just short of downright rude, warm wine and J got the wrong dish, but we were sick of complaining by then. 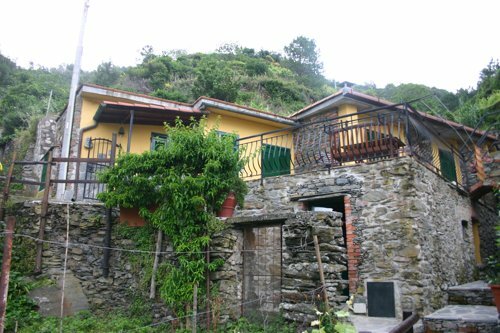 But try the Lampedara as it too is recommended and looked great), then walked to Manarola. 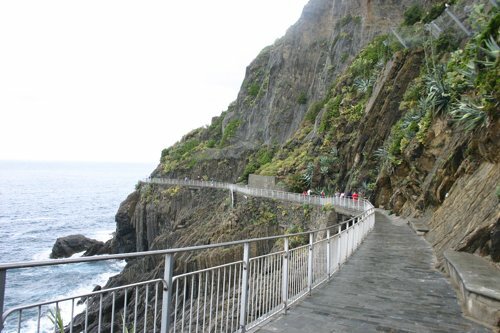 The path to Manarola is really a superhighway, wide, well maintained, and with resting spots all along it. No trouble at all to survivors of the Vernazza-Corniglia route!! 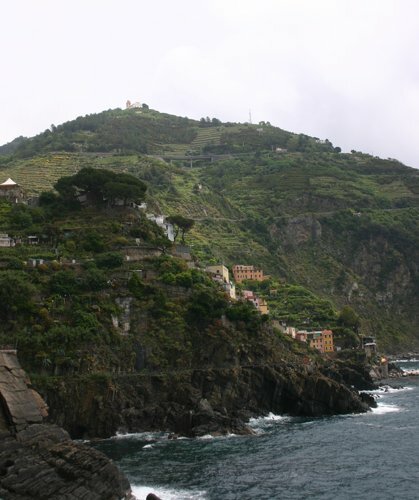 but it meant we were unable to catch the boat back from Manarola to Vernazza, and had to take the train instead. On the way we got the bad news that it may take 2 week to repair the car, as there are no parts in Italy, and no matter wherever we are, we have to take the rental car back to Ovada!!! So we returned home to Vernazza and after a fortifying glass of red we went out for dinner to one of Michele's recommendations, Trattoria di de Sandro. We had met a couple from Adelaide, staying in the Camera Giuliano with us, who also recommended it. J had the calamari, fresh caught that day, and lovely and sweet and tender it was, in one of the lightest batters I have ever tasted. I had the tegami (?? I think it was called), a local dish, made of a layer of potatoes, a layer of boned fresh sardines and a layer of tomatoes, with herbs, olive oil and garlic sprinkled over, and baked in the oven. It was absolutely delectable, and so different. I had a chat to the chef in my broken italian, and he seemed happy that someone wanted to know about it. A lovely meal and highly recommended. Another speciality which the Adelaide people recommended (which we didn't try) was stuffed mussels. And another recommendation, a restaurant where Michele's husband Giuliano works at night, is Ristorante Pizzeria Vulnetia, which is down at the harbour. We didn't eat there ourselves, but it is reported to be good also. 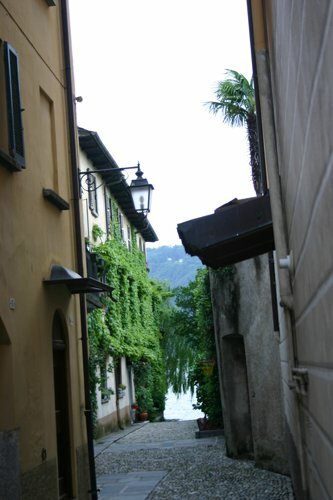 Left the lovely Lake Orta today and headed for Vernazza, on the Cinque Terre. 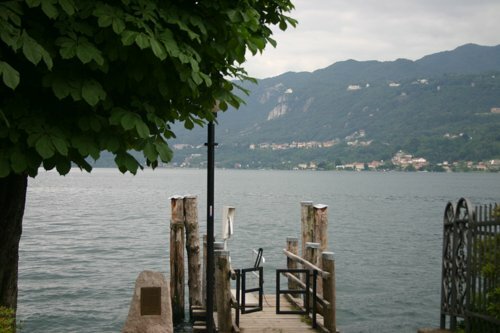 A last few shots of the lake and surrounds - it is cloudy grey day, we were lucky to have fine weather for Stresa. 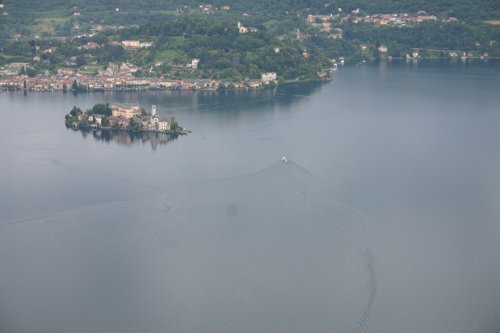 That is Orta San Giulio in the background, jutting into the lake. We hit the autostrada towards Genoa, and noticed that the clutch was sticking. We drove for a few hours then pulled in to a large service area and filled up. When we went to start the car the clutch wouldn't work at all. We eventually got on to Peugeot roadside assistance and they sent a tow-truck. 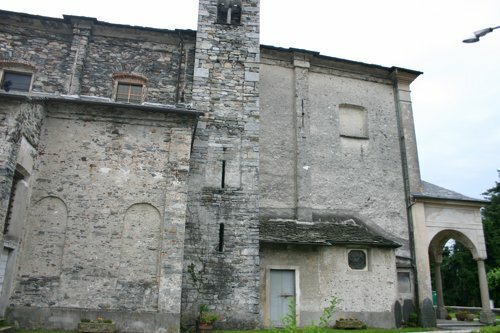 We were taken to a town called Ovada about 45km north of Genoa, and waited for 4 hours. 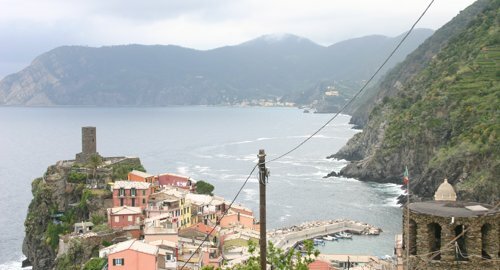 Finally they asked us if we wanted a hotel or a rental car, so we took the car (a Renault Laguna, brand new) and headed for Vernazza. We arrived in Vernazza around 9pm. We drove down to the resident's parking to drop off the luggage and met Michele, the American wife of the Italian owner. 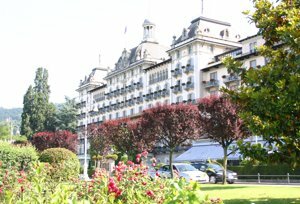 Michele and I took the bags up to the room (about 600m away) and J drove the car back up the hill and parked it in the tourist's parking. He then came back down, and I met him at the Pirate's bar opposite the resident's carpark, with a glass of wine in hand. We had a quick pasta and then I took him to the room. 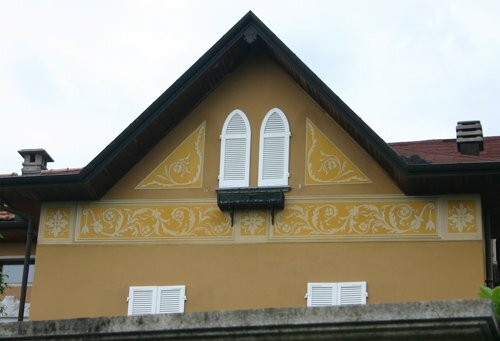 They are beautifully decorated and share a series of terraces, from where one has a fantastic view of the town. Today was overcast and rainy. 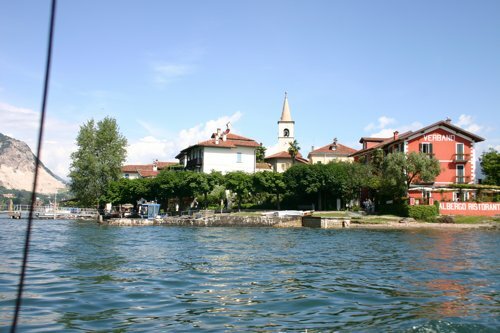 We had decided to go around the lake and look at the small villages, starting again with Orta San Giulio and the Wednesday market. We drove there and the market was quite a fizzle, the same old trat we see in other places, cheap clothes, socks, jeans. The fruit and veg, cheese and salumi part of the market was up in the top car park, not down in the town at the main piazza where the other stuff was. 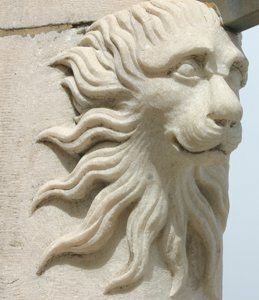 the church is lovely, and has a pulpit carved in very simple 2 dimensional characters of the representation of 4 of the saints - the lion for St Mark etc. 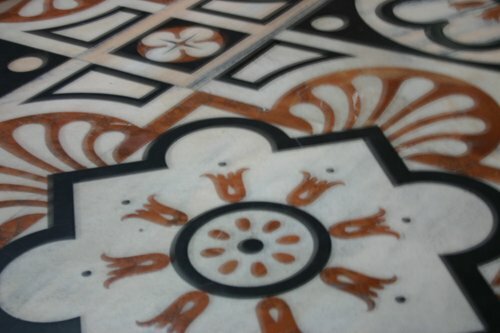 It also shows the triumph of good over evil - a phoenix overcoming a crocodile and other interesting animals. No pictures, though. 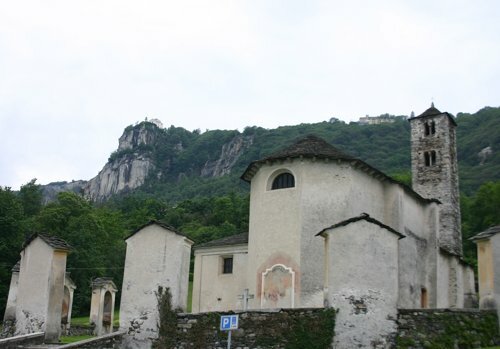 Underneath the main church (which is pretty small) is the body of the saint who apparently banished the dragons and serpents from the island and made it habitable, and founded the church, in 972 or somewhere near there. The island has one road that goes around it. 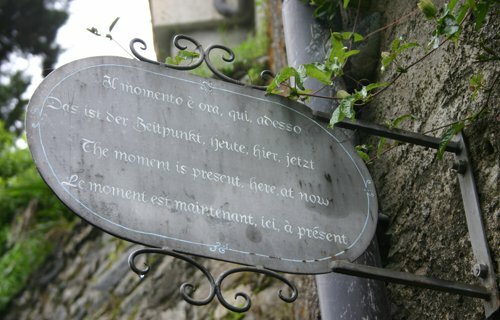 In order to maintain some peace and quiet the nuns have placed signs with pithy sayings on the walls along the path. if you walk clockwise then you are walking the way of meditation, and the signs give you deep thoughts on which to ruminate. If you walk anti-clockwise then you are walking the way of silence, and the signs bid you look inside the silence for yourself. 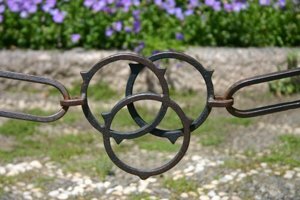 We walked around the island, following the path of meditation, past signs and old buildings and private gardens. 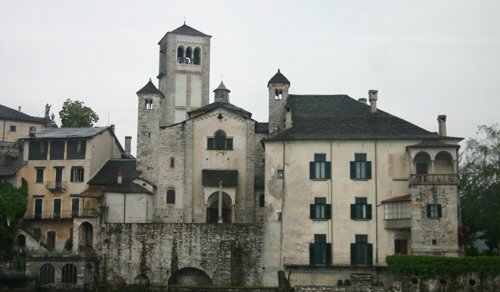 We walked past the nunnery, then back to the wharf and caught the boat back to Orta San Giulio. We got back in the car and drove around the lake. 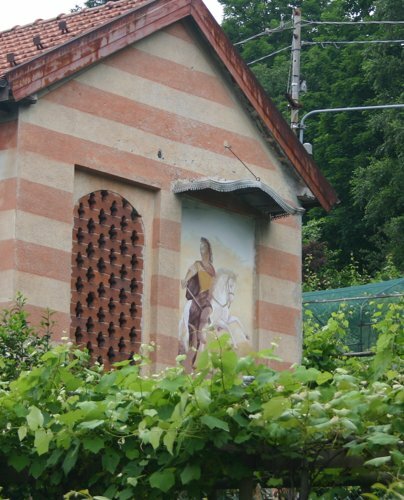 We went to a painted village, but not what I was expecting - some of the houses had fairly modern paintings on the outside. Then we went to a tiny cobbled village and had trouble with the car in a tight lane - sigh! We went back home for lunch and a rest. 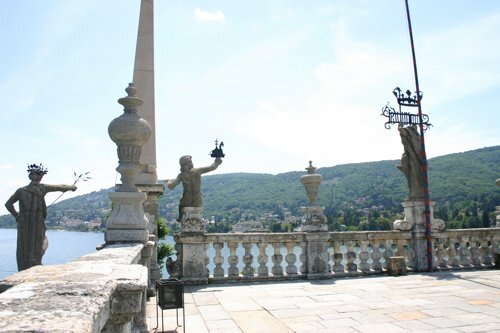 As you can imagine, the view down from the Sanctuary terrace is phenomenal. 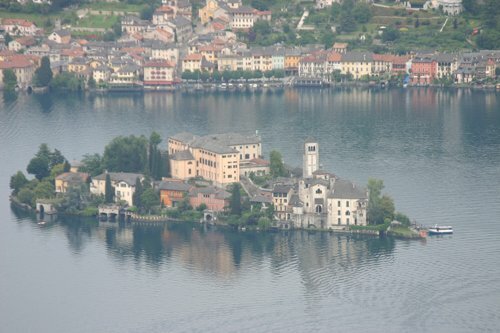 of course that is Isola San Giulio from Sanctuary. We ate an indifferent dinner at Ristorante Leon d'Oro - perhaps the weather had influenced the chef! 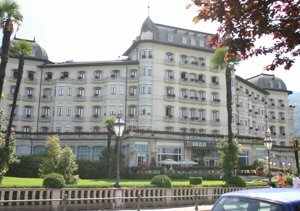 Today we headed early into Stresa. J had been there on Sunday night and it was so crowded that he was unable to find parking so just drove around and left. We are hoping that was because of the public holiday on Monday, and that Tuesday will be better. And it was. We parked in front of the wharf and were immediately accosted by a fellow in a sailor's outfit asking if we were going to the islands. We said yes, then bought a ticket from him (66E!) and waited a few minutes for a boat. It then dawned on us that these fellows lie in wait for unsuspecting tourists and take them on 'private' tours to the islands. The public ferry costs 3E!! 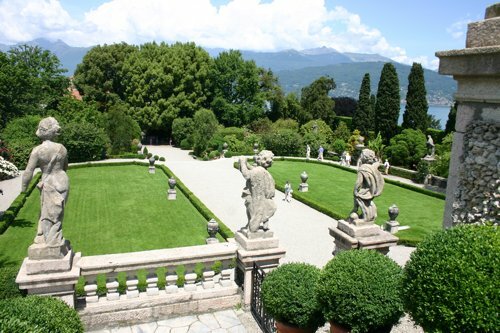 Anyway, off we went on our tour of the Isles Borromees. We had done this 21 years ago. 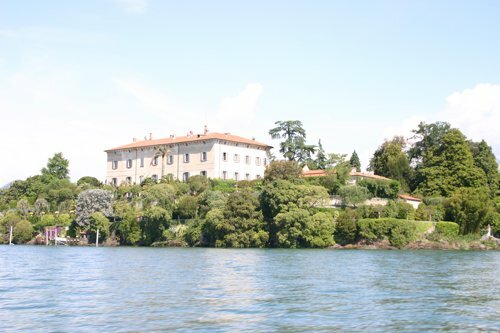 We motored around Isole Madre, the island that contains 2 houses and is a huge English style garden, but did not get off. We then went to Isola Pescatorie, the fisherman's island. 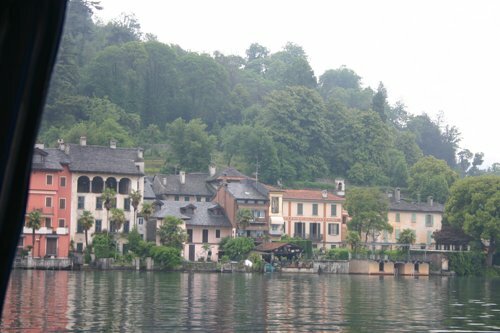 Sadly, this and Isola Bella have heaps of tourist traps lining the waterfront, so one must navigate through these to get to the treasures. Isole Pescatorie used to be the island of fisherman, and there is still some fishing going on here. But the main trade is tourists. There island has a circular track, and one through the middle. 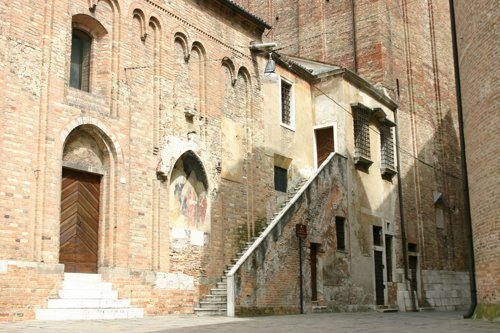 There are some winding small alleys, an interesting church, but not much more. We got our boat to Isola Bella. 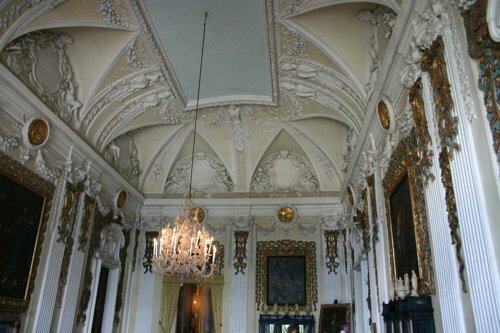 The Borromeo family bought this and gradually moved everyone off and built a huge castle there. 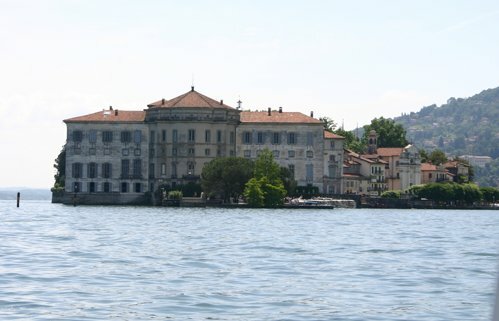 The island was named Isola Isabella after the wife of a Borromeo, but was eventually shortened. 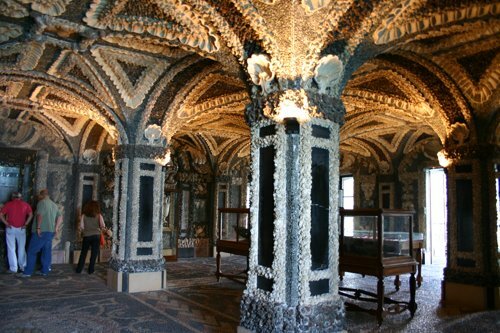 under the house is a grotto, 6 or so rooms, just awful, made of black stones from Naples and what looks like volcanic pumice. 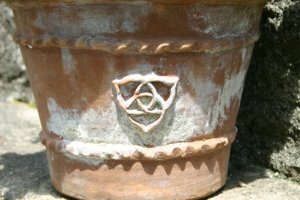 And this decorative style is also used in the gardens. which was absolutely divine. We were so glad that the resturant, though quite different to last time, was still wonderul. Would you believe we were able to eat dinner, after a short rest. J had a pizza rustica, and I had bruschetta followed by bronzino (gilthead bream) with onions and potatoes. 2 large fillets, perfectly cooked, a lovely sauce of shallotts and green onions, rosemary potatoes. Delicious! 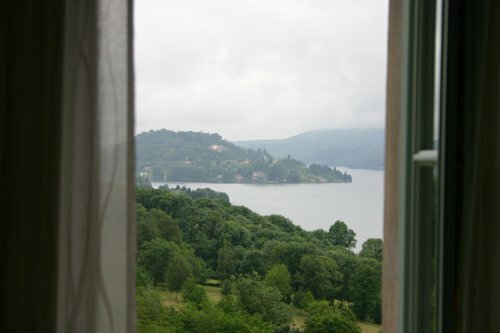 J picked me up at 12 and after tearful farewells to all my friends J and I drove to Lake Orta, where J has been since Saturday afternoon. 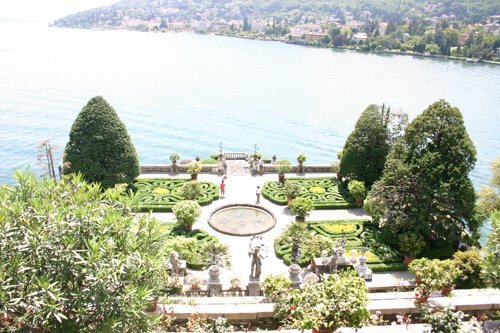 It is an unbelievably beautiful part of Italy. I immediately wanted to stay here for ever. and that's the door into the loungeroom/kitchen at the end on the right. Both bedrooms open onto the balcony. 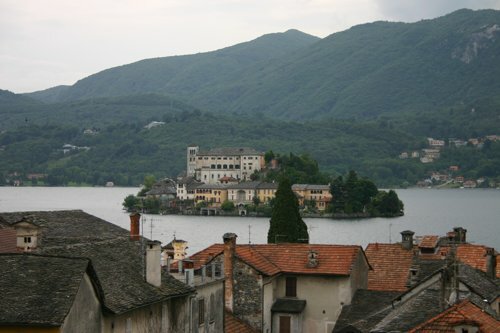 The town of Orta San Giulio is built on a point of land with a little mountain that juts out into the lake, and opposite it, 400m away, is the tiny island (the only one in the lake) of Isola San Giulio, home to a nunnery and a very old church. 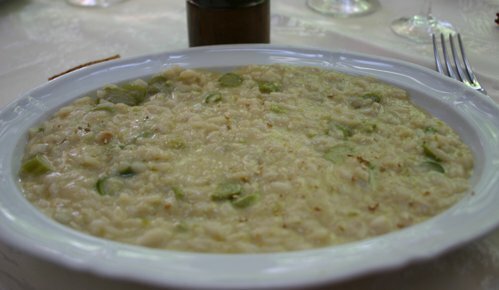 We had an OK dinner in town, at Ristorante Olina, but it was our poor choice rather than their cooking. We were too late to order meat, so had to be content with pasta as a main course. I started with bresaola with pears, pannacotta and jam, and J watched. Then he had a mezzalune stuffed with ricotta in a walnut sauce, and I had ravioli of duck breast in gravy. Tasty, but not really what our tummies wanted. A late rising after our early/late morning, and a pretty dreadful breakfast at Spizzico, Italy's answer to McDonalds. Here you can get pizzas, chips and salads in containers. You can also get pretty good coffee. 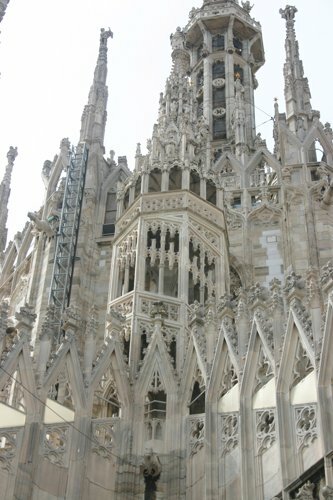 After that experience, we walked to Milan's central Piazza, the Piazza Duomo. 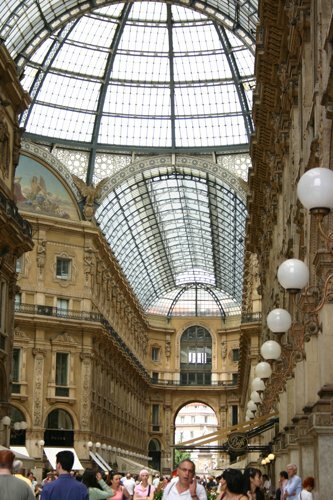 Before I show you that, we took a quick tour of the Galleria (Galleria Vittore Emmanuel II) , a lovely shopping gallery built to link the Piazza with La Scala, and where we made a stop at Prada for a wallet for a friend. In here is the original Prada shop. A quick coffee later and we headed off to the Duomo. 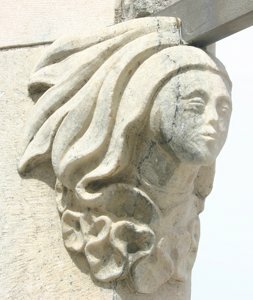 You can't miss it, as it dominates the square. 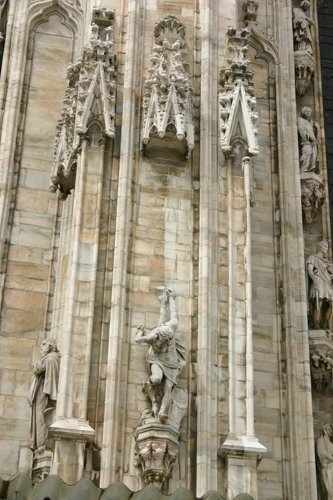 It's the biggest gothic cathedral in the world, and the third largest Roman Catholic church after St Peter's and Seville Cathedral. 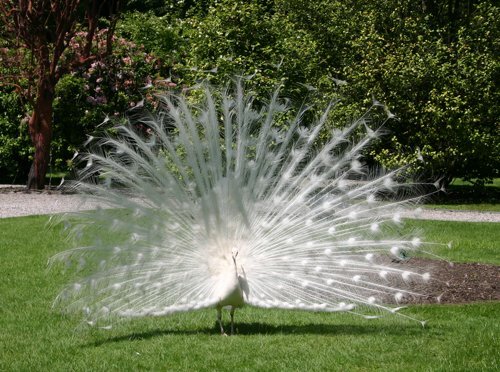 It's almost unbelievable, its so like icing-sugar decorations. Apparently it's been under restoration for over 5 years and only came out of wraps in 2006, even though some of it is still swathed in hessian. 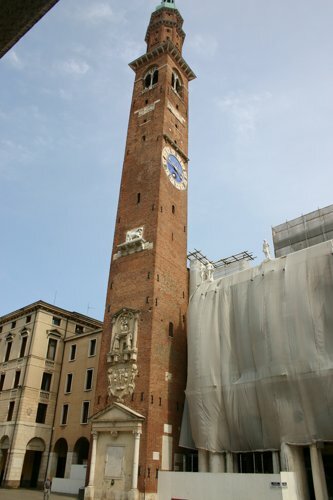 You may just be able to see that part of the hessian looks transparent, but in Italy they paint on the covering what the underneath building will look like. They do this even when a house is being painted or new windows or anything. 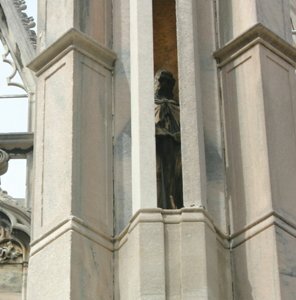 So the covers are painted to show what the cathedral underneath will look like. 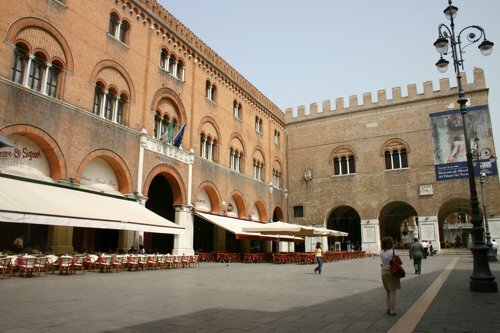 In front of the cathedral is a wide expanse, then steps all around the front lead down into the Piazza. Tomorrow there is a free open air concert with Andrea Bocelli and other opera singers, and the backing orchestra is practising in the square. The sound is magnificent. Add to that that it is a lovely sunny day, and you have to pinch yourself to believe you are here. Later on, Andrea Bocelli comes to test the sound levels with, at different times, both a male and a female opera singer and the glorious blend of voices fills the square.it is sublime. looking for the ticket office, because you can go up on to the roof amongst the flying buttresses. You can climb the stairs or you can take the lift, which I did. 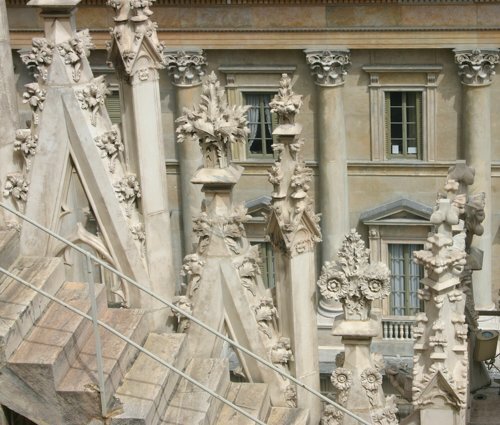 Of course the view is stupendous, but the work amongst the roof arches is amazing. 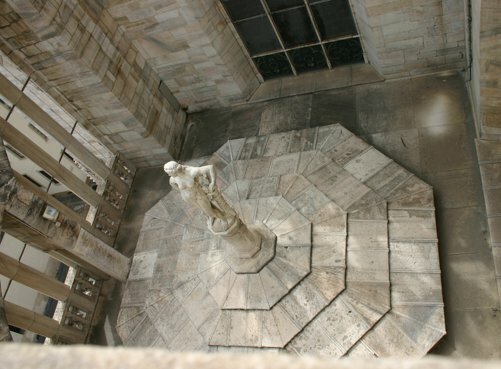 There's even courtyards of statues that can only be seen if you are up on the roof looking down. We came down and listened to some more of the rehearsal for the Andrea Bocelli concert, had a granita then went back to the hotel for some more sleep. We ended up for dinner at a Sicilian fish restaurant that we stumbled upon. It was great. There was a huge antipasto selection of fish and shellfish, and we ended up with crumbed sardines, mussels, octopus and fresh marinated anchovies. 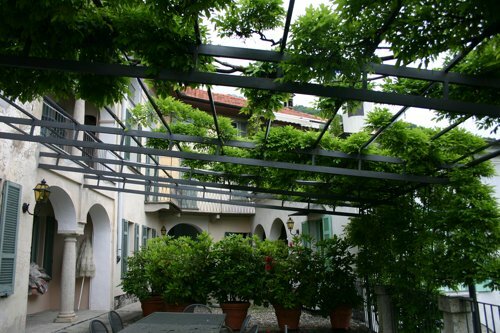 The hostess then sent out 2 plates of pasta,one a spaghetti with sarda in saor, similar to the fish that G had had previously for lunch, tossed through spaghetti, and one a tomato pasta with grilled eggplant and ricotta, similar to the dish J had had at Donna Irene in Padua. Lovely, but so filling that we had to forgo any more food and settle on dessert. The hostess' daughter and mother came in, and the daughter spoke excellent English so we all chatted for a while and exchanged addresses, before some of us left for bed and some left for more nightclubbing. 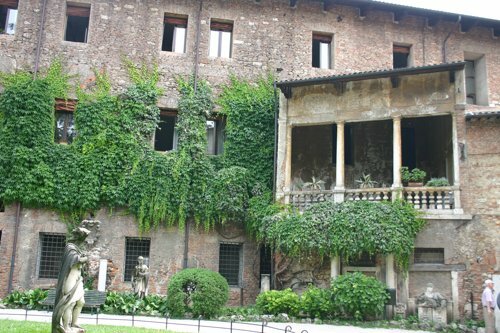 We left Villa Selvatico and headed for the A4 Milan-Venice autostrada. Two hours later we were in Milan. 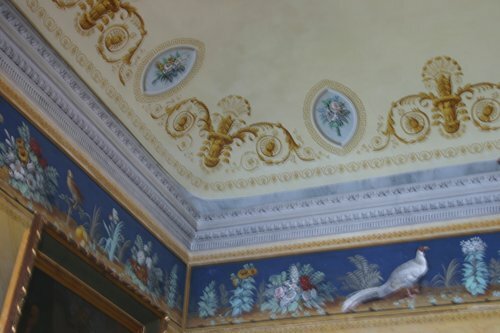 After going around the Piazza Loreto a few times trying to get through the traffic to our exit, we managed to get to the hotel Doria Grand on Via Andrea Doria. 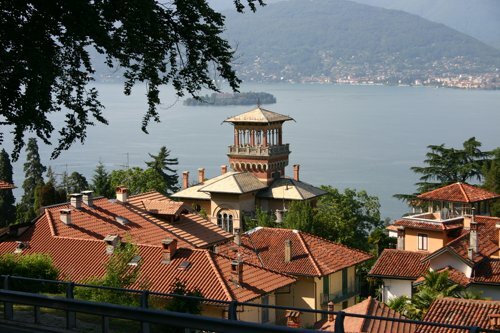 J dropped me there and headed off to Lake Orta. I met up with my friends from Sydney who have been holidaying in Italy, and after a longish catch-up chat over champagne we headed out to Ottimana for lunch. 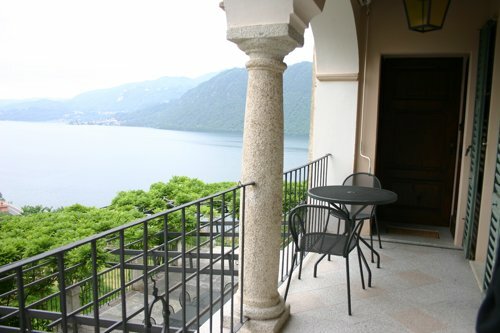 Ottimana is a deli/restaurant - you can buy any of the pre-prepared food to take home or to eat in the restaurant. They also have a system where you buy a card and can then take glasses of wine from a large dispenser. The bottles are suspended upside down and dispense 100ml into a glass when you make a choice. We all had the rice salad, as G and P had had it the day before and loved it - it's rice with finely grated zucchini, chopped green onions, ricotta and finely chopped mozzarella tossed through. I then had the small tasting plate of prosciutto and salume, G had the sarde saor, the Venetian speciality of sardines in vinegar with pine nuts and raisins, and P had some small veal slices in a mushroom sauce. 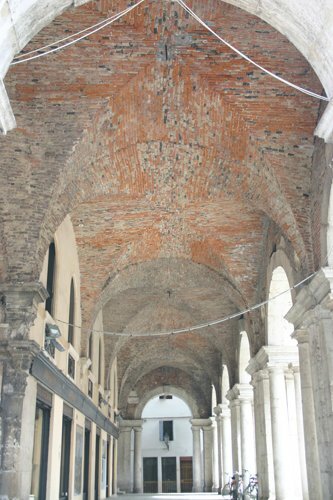 After lunch we walked around the shopping area of San Marco. 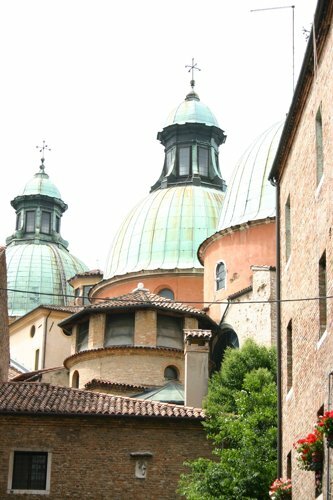 Monday is a public holiday (2 June is Republic Day in Italy) and a lot of the shops are shut from Saturday afternoon to Tuesday. Despite that, many, such as Dolce & Gabbana, are open, and there are lots of people in the streets. We stopped for a drink at a very up-market hotel and watched the streets and chatted. Then we left to catch up with more friends from Sydney, A and J, and D from Switzerland. Another drink and some bar snacks, which are free with the drinks, then back to the hotel for a rest before heading out to a nightclub, where we stayed until it closed at around 5.30am. 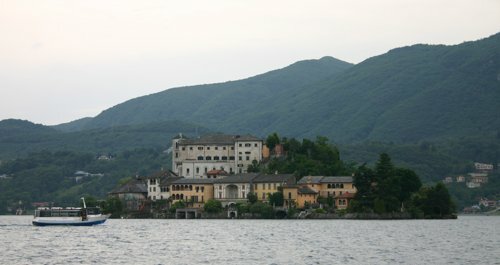 J meanwhile had had a terrible time getting out of Milan and reached Lake Orta and the house we are staying in, at 5.30pm. He reports that the house and lake are lovely. and to the Naval Museum. This was absolutely fascinating. 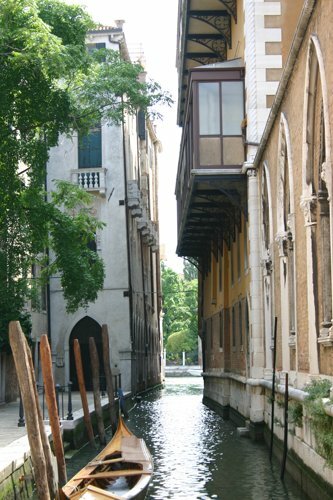 The museum has bits and pieces of Venice's (and Italy's) seafaring past from the earliest times to the present day. 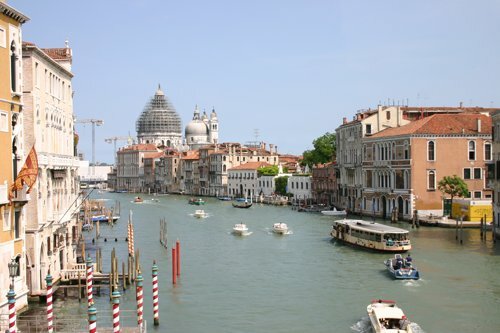 After Napoleon conquered Italy he gave Venice to the Austro-Hungarian empire, so they have a strong tie to that. 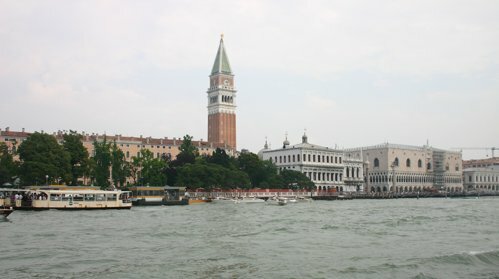 As well, when Sweden and Russia were at loggerheads in the early 19th C, Russia decided to build Venetian ships with low draft, so Sweden sent navy people to Venice to learn how to build these, thus Venice and Sweden also have strong ties. 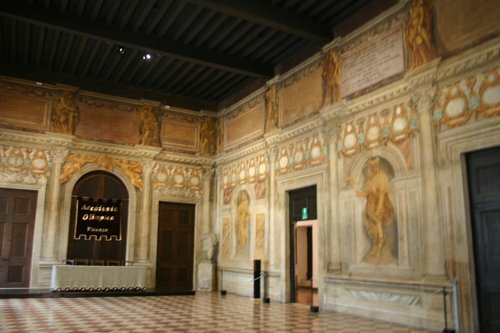 The Museum contains many models of Bucentaurs, which is the name given to the ships that were built to commemorate the ceremonial marriage of the Doge to the sea. It was a very interesting museum. until we finally caught the 7pm train home. 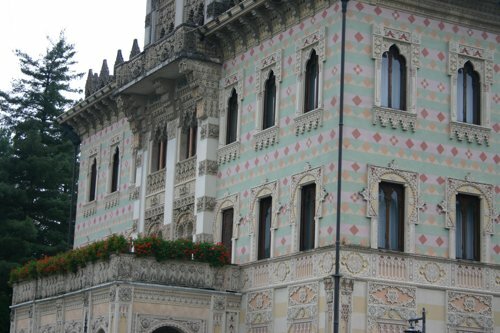 Drove into Vicenza late this morning. Its about 40k away. 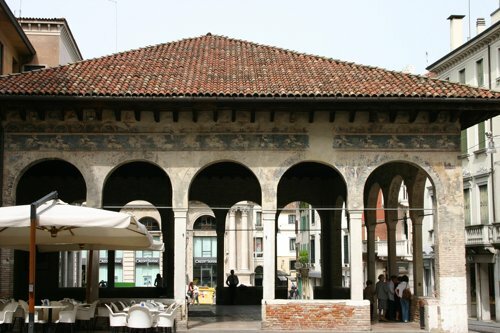 Its famous because Andrea Palladio created many of the public and private buildings here, and the whole town has been declared a UNESCO World Heritage site. 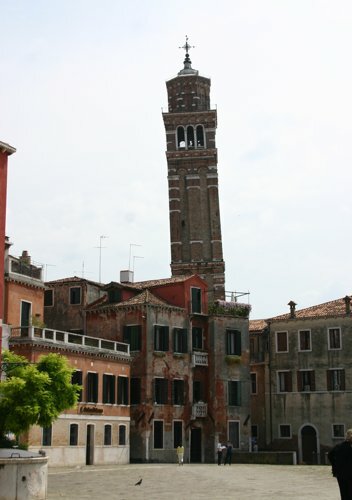 It's a very pretty town, even with the presence of Palladio's buildings at every turn. 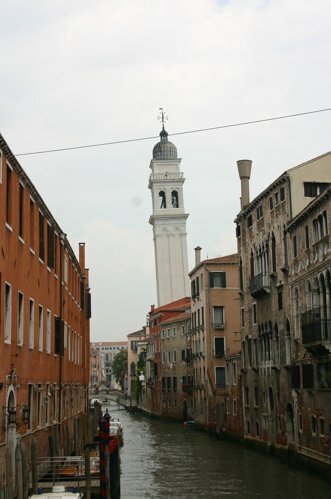 The streets are wider than most towns, and all the buildings seems to be copies in some way of Palladio - everything has large wide fat columns holding up a 2nd story. Because the buildings are tall and the streets are relatively narrow it can be hard to take a photo; the eye is much more capable of adjusting the perspective than the camera is. 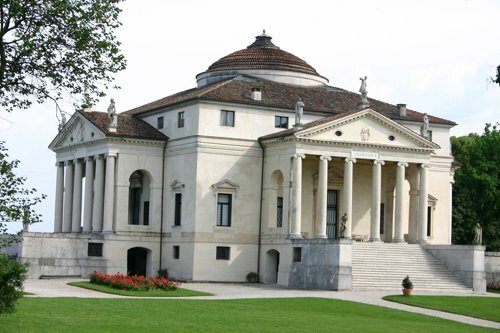 The first thing we saw was the Teatro Olimpico, the last work Palladio designed, in 1580. 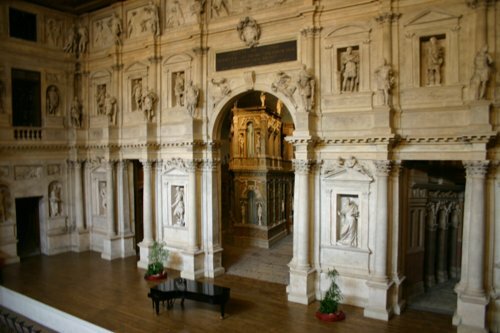 His son took it over after his death but it was finished by Vincenzo Scamozzi in 1583, The play Oedipus Rex was the frst play performed there, and in many ways the theatre was built for the play. In 1997 (I think) the play was re-enacted using the same original theatre configuration and costumes. 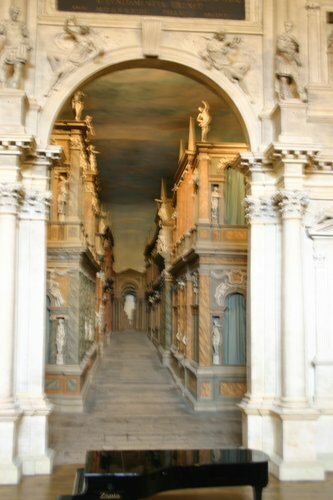 these are mock streets of Thebes, and give the play a sense of depth. They are made of wood and a letter written at the time of the first production comments on the cunning lighting that made the stage seem larger than it was. 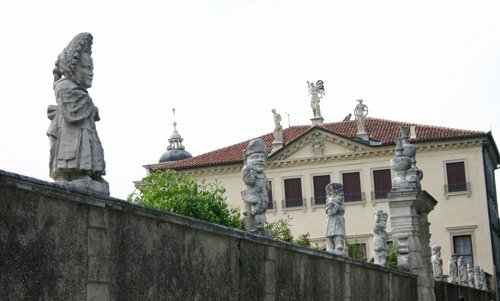 The stage is covered in figures of the members of the council that saw the construction of the theatre, and even Palladio has a statue here, but we couldn't find it. Outside and a brief stop for lunch before wandering more around the town. It's very attractive and certainly worth a visit. 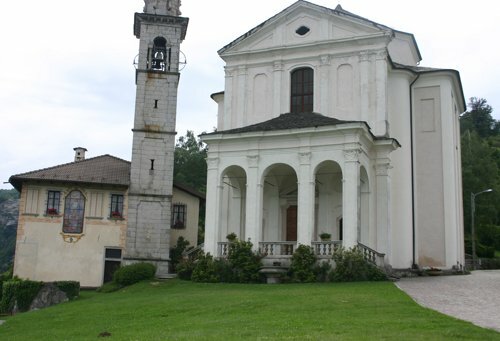 Here is one side of the Basilica (place of justice), by Palladio. 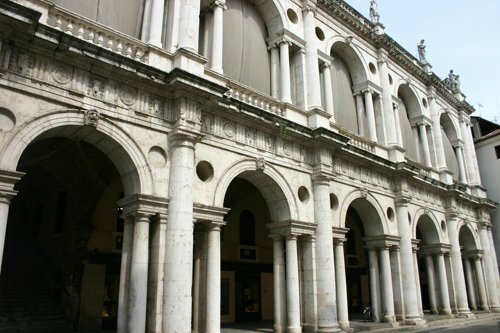 It was built in the Piazza della Ragione with 2 open marble colonnaded galleries. 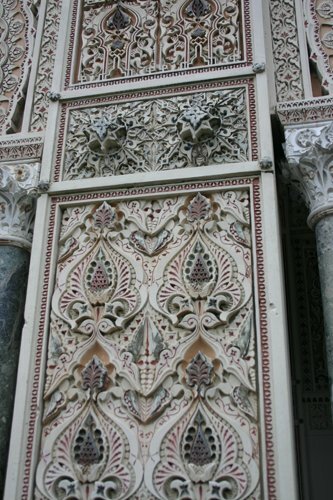 all 4 sides have the same aspect, with different pithy sayings carved over the doors. 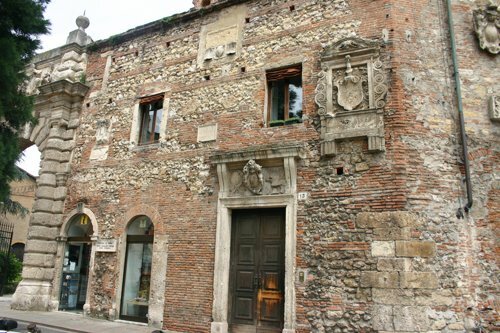 We came home from Vicenza and headed back into Padua for another meal at Ristorante Donna Irene. Before that, we visited the Prato della Valle, one of the largest squares in Europe. 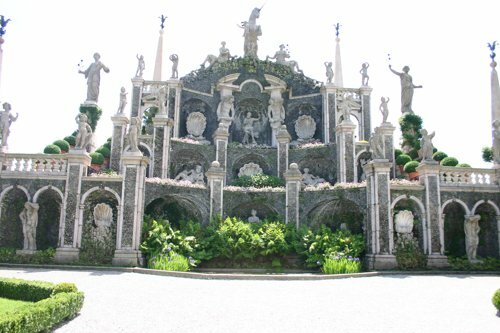 It was laid out in 1775-6, and in the centre is an island planted with trees, surrounded by a pool and 78 statues. I tried to take the whole square, but the photo is too small to really show how large the square is. Finally, off to Donna Irene for dinner, and it was fabulous as usual. J had the taglietelle with tomato, ricotta and eggplant. The pasta itself was tomato pasta, with fresh ricotta stirred through it and grilled eggplant laid over the top, grated salted ricotta on top of that. I had the baccala mantecata, which is baccala soaked and reshaped into small scollops like scoops of ice-cream, with biscuits that were transparent shards of poppyseeds and egg yolk. Very mild tasting, and interesting. J followed with a fillet of pork and artichokes, and I had involtini of veal, filled with herbs and cheese. Absolutely delicious. We were unable to fit in dessert this time!! I had a glass of prosecco and then the same Sicilian red that I had had on our previous visit. If you're ever in Padua, go to this restaurant. 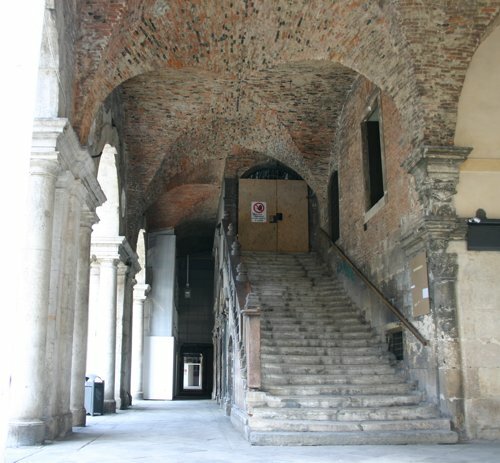 It's in via San Francesco, just where the river splits, past via Ospetale Civile. 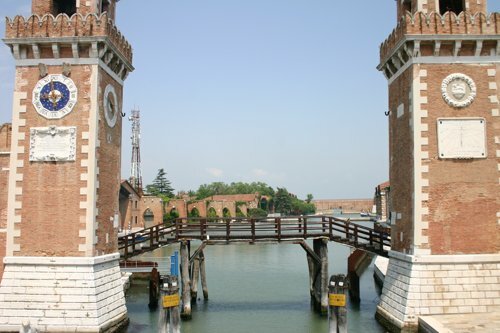 Headed to Castelfranco Veneto today as an Italian friend from the Veneto had given us a list of places to visit, and Castelfranco was on it. The name indicates that it is a walled fortress and has the right not to pay taxes. 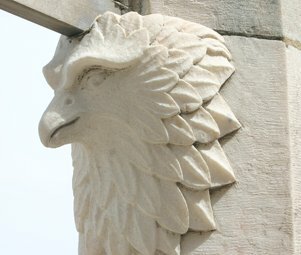 It was allied to Venice until the time of Napoleon. 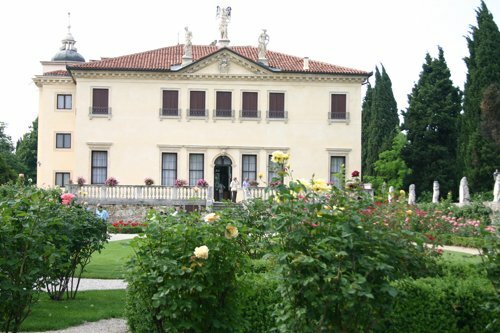 In the 18th C, many wealthy Venetians, in order to avoid excessive taxes, built villas outside Venice, along the Brenta Canal and in the outlying towns,such as Castelfranco, Treviso and as far southwest as Padua. 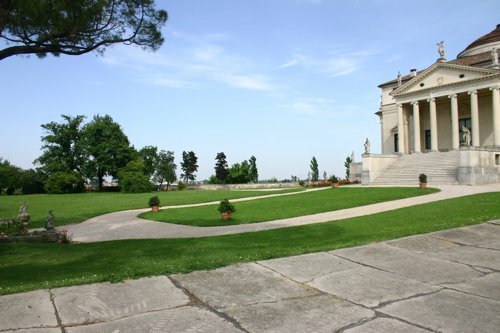 That's why Palladio was such a big hit way back when, and why there are so many lovely villas out here in the flat farmlands. 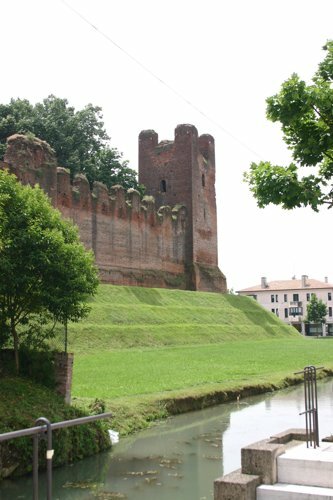 Castelfranco has been around since about 1000, and is a lovely small walled village surrounded by a moat. the town has not much to recommend itself, except the lovely walls and the gardens between the town and the moat. Most of the economy and living takes place outside the walls in the more modern part of the city. We did have a lovely lunch in the shadow of the local Duomo, originally 11th C but rebuilt in 18th C. I had an interesting 'dessert' - crema caffe - it is the cold froth of coffee laced with coffee/caramel syrup, and you eat it with a spoon. Very nice indeed. 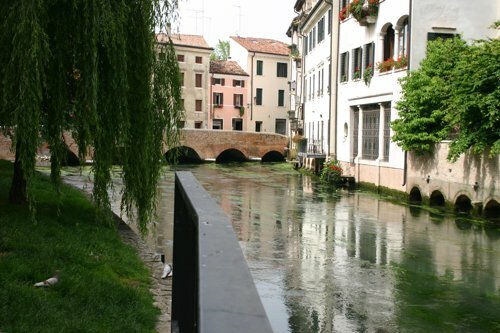 On then to Treviso, a really pretty town and well worth a visit if you find yourself in this area. 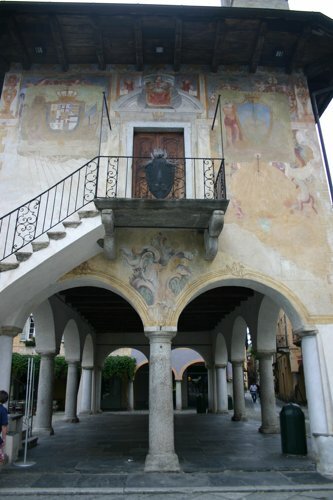 Again, a smaller walled village inside a fairly large modern town, though not as big as Padua. A small university inside. The town is exceptionally clean and attracctive, amd I suspect rather wealthy, as the shops were at the height of fashion and there were a lot of them for the size of the town. It is like Bologna in miniature. A very nice town. And a very nice (expensive) internet cafe too. 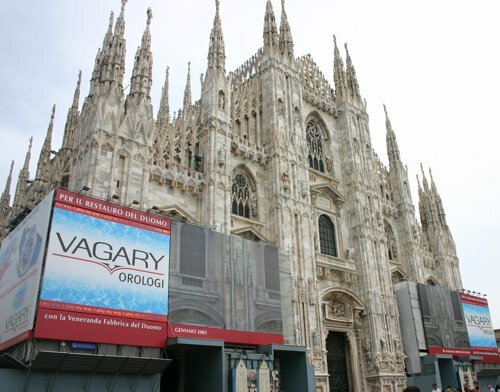 We spent a few hours here, and had a drink at the large cafe in the main square, before heading home for fresh asparagus and poached eggs with parmesan cheese and balsamic vinegar. Yummm!!! Sometimes it's nice to cook! 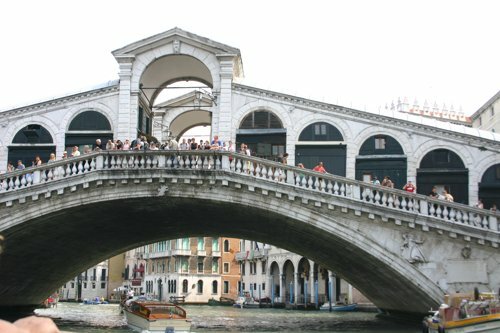 Venice tomorrow, nice and early! !